1. Amongst A and B, which thermometer will register fall in temperature first and why? 2. Which thermometer will stop registering fall in temperature after sometime? State the magnitude of lowest temperature recorded by this thermometer. 3. 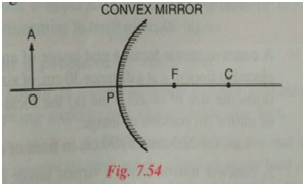 Give an explanation of your answer in (2). 4. Why does the second thermometer goes on recording fall in temperature? 5. What conclusions can be drawn about the nature of water from the above experiment? 6. State one natural consequence of the above property of water. 1. Thermometer B. It is because, as the water in the region of freezing mixture, falls in temperature, its volume decreases, its density increases and hence it sinks down. 2. Thermometer B. The temperature of thermometer B stops registering any fall in temperature. the lowest temperature recorded is 40C. 3. It is because when water attains a temperature of 40C, its density is maximum. Thus, it just settles down and cannot rise up. 4. It is because, when the temperature falls below 40C, the water starts expanding, its density decreases and hence it moves upward. Thus, thermometer A continues registering fall in temperature. 5. (i) Water has maximum density at 40C. (ii) Water has minimum volume at 40C. 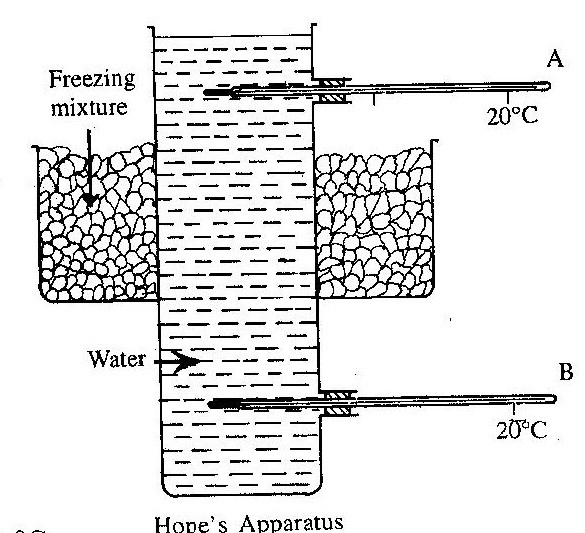 (iii) Water has anomalous expansion i.e., it expands, if heated or cooled from 40C. 6. When the water bodies (such as lakes; rivers; seas;), freeze in cold countries in winter, only the upper surface freezes to form ice. Water below ice stays at 40C and hence, water animals can survive.